The Top Yard team at St Neots. From the left are coach Majid Romani, Mustafa Rafiq, Omar Shaheen, Junayd Ali, coach Ballal Javed and coach Hamad Javed. City boxer Mustafa Rafiq made it two wins out of two when fighting at a show at St Neots on Saturday (April 29). The Top Yard fighter boxed C. Scott from Corby ABC and emerged a comfortable points winner. 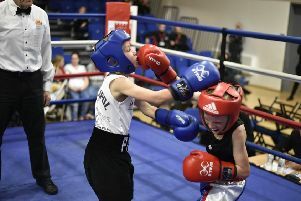 Two other Top Yard boxers were in action at the show but were both beaten on points. Omar Shaheen was up against a strong opponent in the shape of the short and stocky S. O’Mara from Norwich and although he connected with some neat shots, he was overwhelmed by O’Mara in the toe-to-toe exchanges. Junayd Ali was unlucky again and is still searching for his first win. He fought C. Collings from Norwich and produced his best fight to date. His corner felt he did enough to win. He threw the cleaner shots and used the ring well but didn’t get the verdict.